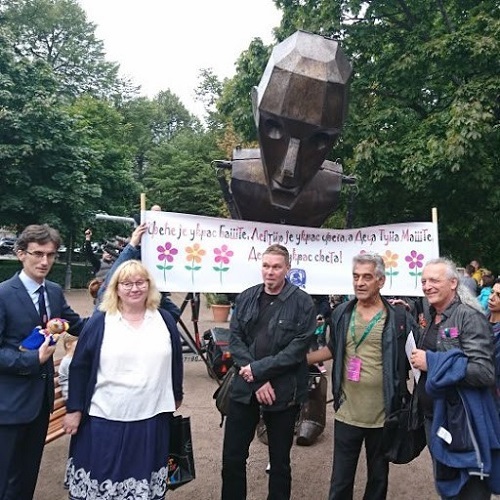 Puppet Theatre “Pinokio” from Belgrade performed its play Max Metallic on 31 August at Espan lava stage in the center of Helsinki. The story about life and love of this puppet tall 5,20 meters, who was created in Finland 17 years ago and who became, from 2000 onward, a hero of Belgrade’s Puppet Theatre, was supported by UMO jazz orchestra from Helsinki. 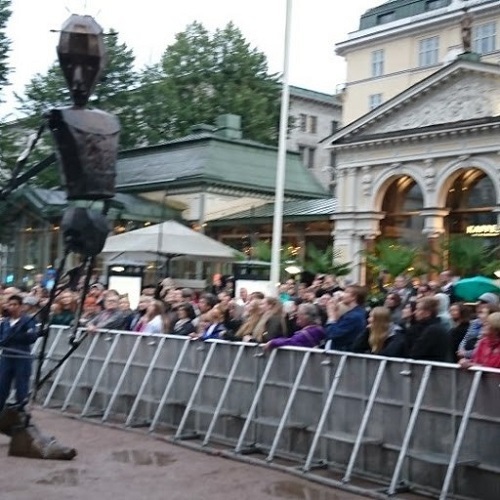 The performance took place at the First International Festival of Puppet Theatres in Helsinki – SAMPO 2017. Photo bellow (from left): Ambassador Saša Obradović; Katariina Metsalampi, Chairperson of the Artistic International Association Small Size; Jari-Jussi Voile, Creator of Max Metallic; Vladimir Lazić, Manager of the Puppet Theatre “Pinokio” Belgrade, and Bojan Barić, Founder of the SAMPO Puppet Theatre and Director of the Max Metallic performance.